A Telehandler was "Overturned" (see photo above). 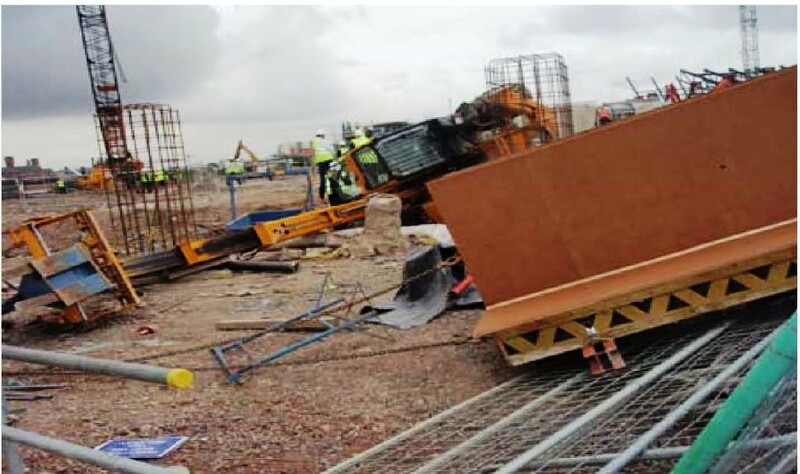 Fortunately, there were no serious injuries reported at site either the operator/driver of the telehandler was very lucky that he escape from the incident. The root cause appears to have been the load swinging while the Telehandler is at motion at a very slow speed over rough ground with the boom fully extended. 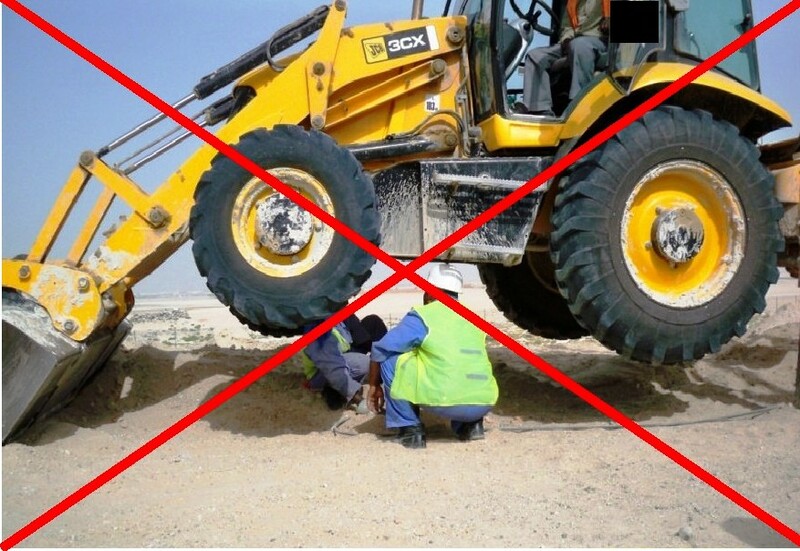 Reminders: The practice of using forklifts and telehandlers as cranes "free-on-wheels" should STOP. A lifting plan must be in place. The driver and signaler or slinger must have the appropriate training. Traveling must be controlled by a banksman. The lifting attachments must be secured to the forks. Telescopic booms are to be retracted as far as possible. The load must remain as close to the ground as practicable while traveling. Now, if the above criteria cannot be met, an alternative method of load relocation must be put in place.
" Follow the procedures of Lifting Equipment Law. Loads must be assessed prior lifting and the correct lifting machines shall be acquired as per the assessment. Lifting plan must be formulated & discussed with relevant parties. When required to drive with a load, the route shall be as short as possible and road level & boom as short & low as possible. Also, the forks shall be used as per manufacturers instructions and NO slings attached to it." 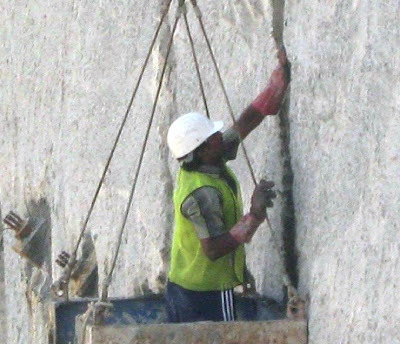 It was observed that the worker on this photo was plastering a diaphragm wall using a man basket at an elevation of 6 meters above ground level without any fall protection or full body harness. There was no proper safety measures at all. This unsafe practice must be STOPPED immediately. Separate anchoring sling arrangement from the main crane rope or from the crane hook block support shall be used by the people using the man basket. People inside the man basket should wear the full body harness (mandatory) and tie the lanyards to the separate anchoring sling. In the event of failure of any sling attached to the lifting man basket or any defect in the crane hook, a safety measure is to secure the person to the crane independently to prevent fall from height of the person with the cage. Foreman's must coordinate with the safety team to conduct toolbox talks and implement proper safety measures before starting work. Operations Team must coordinate properly with the Safety Department for any work at height and other work process which requires Safety Assessment. Safe work procedures must put into practice to prevent any dangerous occurrences with full cooperation of Operations & Safety Teams. WHAT WOULD YOU DO IF THIS HAPPENS TO ONE OF YOUR SITES? Work must be stopped immediately and provide a new man-lift with door. Instruct the charge hand or foreman to provide and let the worker use the full body harness. Warning letter must be given to the responsible person and Non-Compliance will result in disciplinary action. Any work at height that is above 2 m from ground level, wearing fall protection is mandatory as this is stated in all HSE Plan, Rules and Regulations. Man basket must be built and tested every 6 months with thorough inspection. Side walls must be minimum of 910mm high and there must be a gate with a lockable latch in the opening. There must be a labeling attached on man-lift advising the maximum load and safety instructions for use. Ensure that the slings used are exclusive to the man-lift operations only to prevent deterioration. Slings, chains, cables to be used are to be inspected at the time of man-lift operation. Last week, while I was conducting a site visit, one of the construction sites, I saw two mechanics greasing the JCB loader/Excavator with its body raised from the ground (See Photo Below). Further observation, the heavy equipment was supported only with two jacks and its loader bucket while one of the mechanics was under the JCB body greasing the under chassis and the other was on his side giving assistance. Apparently this is a very high risk and critical activity. I would say that the two mechanics were just very lucky that nothing happens to them. Failure to provide competent supervision. Failure to provide appropriate and safe work system for such critical activities. Stopped the activities immediately and conduct tool box talks (TBT) to the two mechanics. Note that TBT shoud be done prior to start the work, either in workshop area or at construction site. Field maintenance procedure must be developed. Greasing activities of under chassis parts should be done and included in the maintenance schedule of equipment and to be conducted in the workshop where under chassis pits are available. In case under chassis works could not be avoided, fabricated vehicle ramps are to be provided and acceptable at site. In this photo shown above, you will find unsafe practice of electrical connection mostly at constructions sites. Here, two (2) electric cables were connected to one (1) industrial plug and as you can see the earth wires were cut in order to get the 4 cables into one plug and note that it is supplied by a 220V system. Imagine that this cables were used by steel fixers on the steel rebar cage. What do you think will be the risks? If the cables will get damaged or faulty wiring occur and the live wire of the improper connection plug touched the steel bars, apparently the steel frame will be live and all the steel fixers working at the steel bar cage will be exposed to serious injury or killed due to electric shock. "Any mistake and error in electrical connections could result in a serious accident which is unacceptable on any project. Therefore, this unsafe practice must be STOPPED!" At construction site, NO one is allowed to do any electrical temporary or permanent works unless otherwise he is a competent electrician. Attention must be paid to the competency of the electricians and the quality of their works. Competent supervision to check on all work carried out, that is of regulatory standard and quality. Toolbox talk on the result of faulty wiring to be discussed with all electricians employees. Competent electricians to undertake electrical connections documented inspections carried out on all electrical equipment and connections.